Type: BB spring air rifle. Materials: Mostly metal and wood. Trigger Pull: The trigger pull is pretty good, not super light but predictable. Accuracy: About as good as you can expect from a kids sub $50 BB gun with a non-rifled barrel, it was actually better than I thought it would be. I did experience some flyer BB's, which may have been due to the gun not being broken in yet. Build Quality: When you pay under $50 for a BB gun you don't expect the build quality to be over the top but this little BB rifle is actually pretty nice! It's almost entirely made out of metal and wood, even the lever is made out of metal unlike its competition the Daisy Red Ryder BB Gun. The only plastic I found was the trigger, safety and front sight assembly. 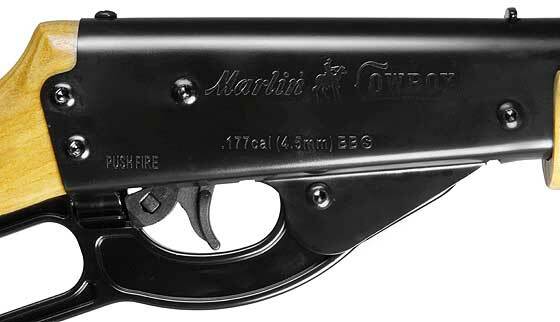 Realism: Even though this BB gun is styled after the Original 1984 Marlin Cowboy, it's not a close replica. You have to keep in mind the purpose of this gun - meant primarily for young first time shooters. For its intent and purpose it does look really nice and if I was a youngster receiving this gun on a birthday or as a Christmas present, I probably wouldn't get much sleep thinking about shooting this gun. Purchased From: Wholesale Sports Outdoor Outfitters. Inexpensive introduction to the sport of Airgun shooting. Made out of Mostly Metal and Wood - Including the Lever. Large capacity internal barrel magazine (700 rounds). 20 pound lever action pull adding a level of safety to the over enthusiastic young shooter. Plastic trigger, safety and front sight assembly. Very small trigger hole - if you are an adult shooter and have thick fingers (Didn't bother me)!. I think this is a wonderful little BB rifle and even though it's intended for the young entry level shooter it can make a great back yard plinker that anyone can join in and enjoy - adults included! The gold standard is the Daisy Red Ryder type BB, the Crosman Marlin Cowboy BB rifle is a nice addition to this market and is definitely a contender to think about.